In recent years,with the economic development of plastic raw materials prices continue to rise,the state is vigorously urged the development of plastic granulator Machine industry and transformation,and huge market demand,plastic granulator design and production concept of a major change again,a full set of three-dimensional,The introduction of systematic service programs,to bring the plastic granulator unit at the same time to bring warfare to the customer more benefits. International plastic pelletizing Machine with a full range of process solutions available to the market,plastic granulator machine manufacturing has made the survival of the service-oriented manufacturing strategic transformation,and service-oriented manufacturing is from the “low-end” to “high-end” The concept of high-end refers to the international industrial division of the high-end value chain,such as the plastic granulator equipment manufacturing high-end is only understood as a single device of plastic granulator production process technology advanced, will guide to the industrial-type road up. 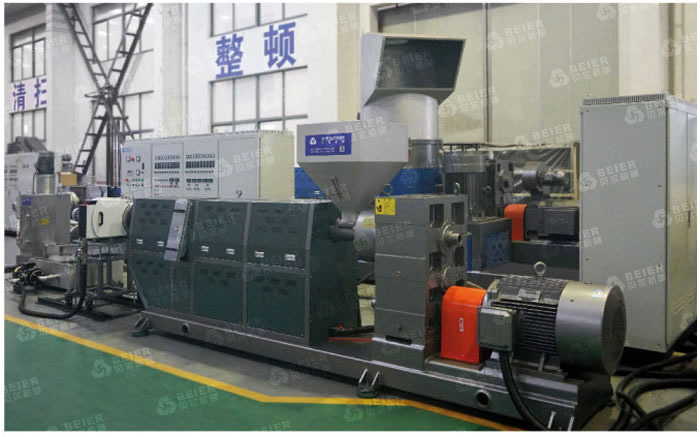 At present,Europe and the United States on the plastic pelletizer mainly to precision granulator, granulator and other high-tech large-scale,high value-added models based.After many years of the introduction of plastic granulator production technology and technological innovation,China’s plastic machinery industry in the field of low-end granulator, the level of manufacturing has been almost the same with the developed countries, coupled with the advantages of labor prices,making China’s low-end manufacturing Granule machine exports accounted for half of the world. High-end plastic granulator manufacturing is able to solve the field / industry “potential demand” plastic products,a full set of molding process,the creation of innovative plastic molding technology and equipment from the relevant areas / industry “potential demand” full range of services Process development.If only the manufacture of plastic particle machine equipment,must be at the low end of the value chain,the majority of value-added by the “potential demand” of the complete solution of the plastic particles owned. Service-oriented manufacturing shows that the manufacture of high-end plastic granulator refers to the high-end plastic granulator in the value chain of a complete solution,highlighting its ability to shape and process,as well as the measure of the advanced level of the technical level of the plastic granulator.Some of the plastic granulator only the technological progress is misunderstood as the original equipment used in some of the design of new technologies,manufacturing new technology,new means of testing,supporting the new pieces,and molding processing capacity of no substantive scientific and technological progress,Just for the full solution provider to provide more excellent equipment,is still in the lower end of the value chain. In the face of serious energy and environmental challenges,China has recently formulated a long-term and medium-term energy technology development strategy and development plan as a guiding ideology under the guidance of a comprehensive, coordinated and sustainable scientific outlook on development.The formulation of this energy and environment development strategy,But also for the development of China’s plastic granulator technology pointed out the direction of plastic granulator technology to explore new development path is imperative.